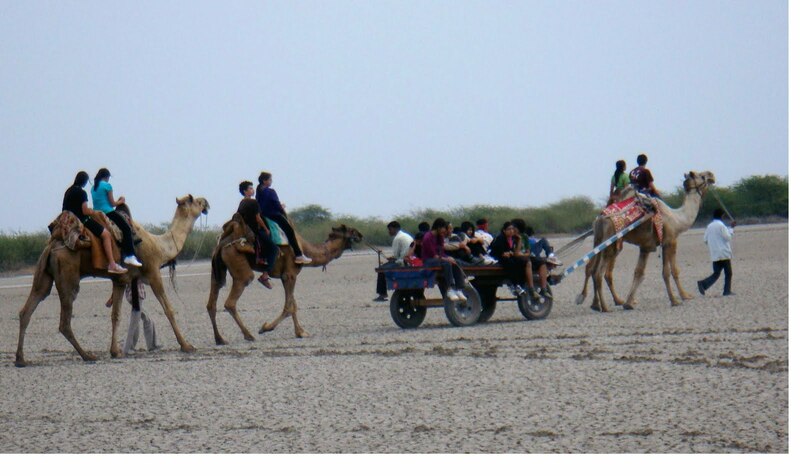 Caparisoned in heavy leather seats with soft blankets, silver bracelets jingling, noses haughtily in the air, the camels in the deserts of Gujrat bounced jauntily at the command of their masters to take us on an unchaperoned tour of their homeland. Regular grooming, brushing and feeding helped build a rapport between the camels and their trainers, essential for turning them into lean and tough warriors, a coiled spring at the ready. Slowly, the camels were coaxed into obeying commands, such as sit down (Jai, jai), get up (Uth, uth), and drink water (Prak, prak). A touch of warmth by the locals in the harsh landscape was a contrast that still lingers, even though I am miles away from the desert in the coziness of my home in Mumbai, penning down the adventure. At every point of the journey, right from the boarding a congested train at Bandra Terminus, Mumbai; to riding a camel; to exploring caves and meeting the Mayor of Abu, adventure was redefined. The Trip had its measure of frolic and hard work, together these attributes blended to form what I think was the best trip in my life. As Oberoi International Students, filled with internationalism and a sense of global service, we young minds explored the ecologically, nutritionally and developmentally correct wildernesses of Abu. I discovered with satisfaction that I never once missed the TV, air conditioner and video games back home. All the more, I was content eating the simple Moong Dal and Roti. In Zainabad, our base camp we found a life so different from ours- one covered by unstable soil and unpredictable rains with little water. We also visited Akash Ganga Orphanage where we were greeted by enthusiastic kids. The next morning promised more fun as we left for Mt.Abu. Enroute we visited the famous Sun temple of Modhera. The historic monument had the power to rewind time by a thousand years. Our Bronze level expedition now had a historical component to it. We boarded another train before heading straight to Abu. At Abu, I had the unique opportunity to both explore the hidden passages of the nearby caves. The exploration component of the trip helped me discover Abu in its true sense- the historical sights, the mythological temples and the ever-cherished palaces. On another beautiful morning, I joined another equally excited group of the trip who challenged the rocks and heights that lured their adventurous minds. We climbed, crawled, crouched, jumped and used all possible locomotive techniques to steer our way through sharp rocks and hard stones and reached atop the hill to be greeted with an amazing view. In a nutshell, the trip was redefining and refreshing, coming a week after our exams. It offered a break to all of us to unwind and go with a fresh mind to school. I have tried to include as much as possible in the article, but I feel that this scintillating trip cannot be backpacked in a few hundred words (Even haversacks are too small!). It wasn’t the smoothest trip, but it was one where every member of the group irrespective of the path they chose ended up in the valley of satisfaction and fulfillment.